AMD is back in the game. Team Radeon is stepping up to the plate to square-off against the might of Nvidia’s Turing architecture with its own high-performance 7nm graphics card. With the Radeon VII AMD is bringing back competition at the very top of the GPU market. At least that’s the received wisdom pre-launch. But AMD has to be careful not to leave another runaway hype train unchecked lest it repeats the mistakes of yesteryear, derailing the Radeon VII in the same way as the first RX Vega GPUs. With the big CES 2019 unveiling of the new 7nm Radeon VII the hype train is already steaming out of the station, rattling through Carefullyselectedbenchmarkville and on to Isthatreallythelaunchpriceton… a pair of small Welsh villages on the southern border of Snowdonia. The Radeon VII will launch as the first 7nm gaming GPU, beating Nvidia, and Intel for that matter, to the punch. It’s using the second generation of AMD’s Vega graphics architecture, but with a die-shrink from the original 14nm design, and retains a few latent accelerators not used away from the professional compute space. The Vega 20 GPU at its heart has 60 compute units (CUs) making for a total 3,840 Graphics Core Next (GCN) cores baked inside them. That’s a touch down on the 64 CUs of the previous generation’s RX Vega 64 card with its 4,096 GCN cores. 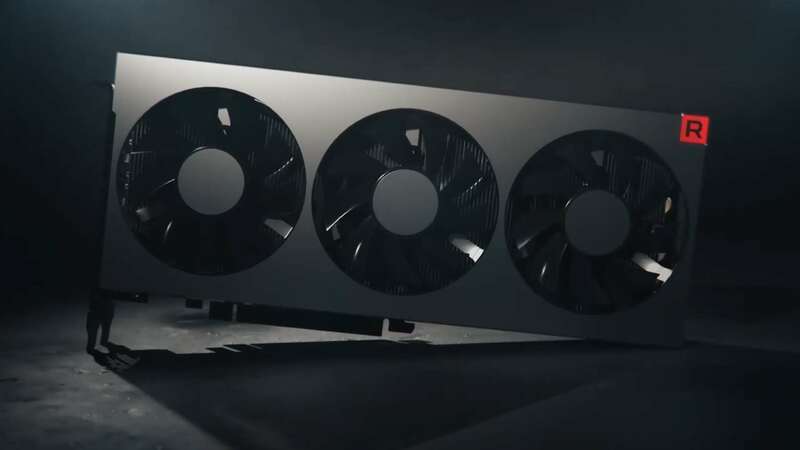 But, despite that step back on core count, AMD has promised you will see the Radeon VII performing at least as well as, if not better than, the competing Nvidia RTX 2080. That’s okay, though, right? It’s at the very least as capable a gaming GPU as the Nvidia chip, with most of the benchmarks we’ve been shown so far displaying an actual frame rate lead for the new 7nm Radeon GPU over its GeForce competition. Compared with those two cards, the Radeon VII is also shipping with twice the memory, offering a huge boost in bandwidth too. We’re talking 16GB of HBM2 for around 1TB/s of bandwidth. How lovely. But that much HBM2 makes for an incredibly expensive graphics card, and so AMD is having to match the $699 launch price of the RTX 2080. But this is where AMD needs to start treading a lightly. The carefully selected benchmarks AMD has published so far all show the Radeon VII in a flattering light. That’s not really a problem – it’s pretty standard practice for any tech company when building pre-release excitement for a new performance product. But the AMD-favouring Battlefield V and Far Cry 5 tests are known to represent more the performance exception than the rule from our extensive experiences testing gaming frame rates across a suite of different titles and a multitude of GPUs. As such it’s not altogether impossible that, once the Radeon VII is launched and put through independent testing via the world’s tech journalists, that we’ll see a similar performance situation as surrounded the Radeon RX Vega 64. 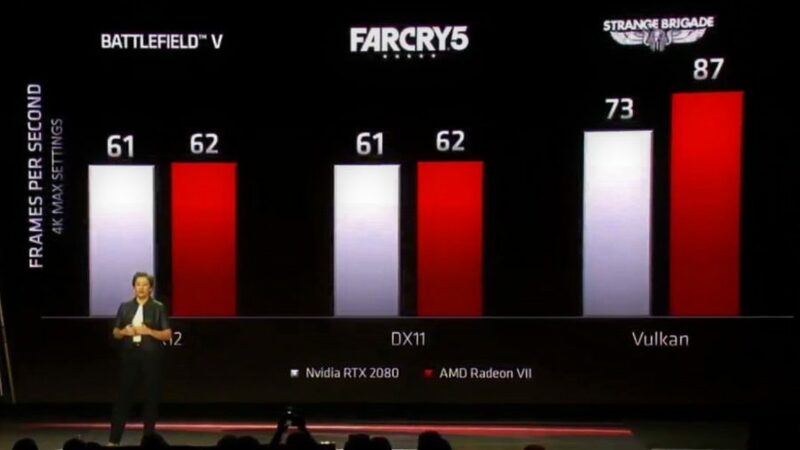 That card was originally pegged, pre-launch, as a GTX 1080-level competitor, but when it was finally released and benchmarked it became clear that only certain games displayed that level of performance while a great many DirectX 11 titles especially really struggled, in comparison, on the Vega GPU. I’m sure there’ll be resistance to my painting the RX Vega cards as a bit of a failure, but while it was a potentially impressive architecture AMD faced an uphill battle encouraging devs to code to its strengths. That did improve somewhat over time, with a few subsequent games really working to the strengths of AMD’s architecture, but arguably not enough of them displayed that level of support. You even saw some game series stepping back from offering DirectX 12 support and reverting to DX11 for later iterations. FIFA 19 and Hitman 2 are two of the games which immediately spring to mind. If that happens again with the Radeon VII, where its RTX 2080-level performance is only shown up by a relative minority of games, then there could end up being a bit of a backlash against the early promises of the new 7nm silicon. But even if the Radeon VII does match the RTX 2080 across the board, its performance isn’t the only potential leaf on the track for the hype train to be wary about. 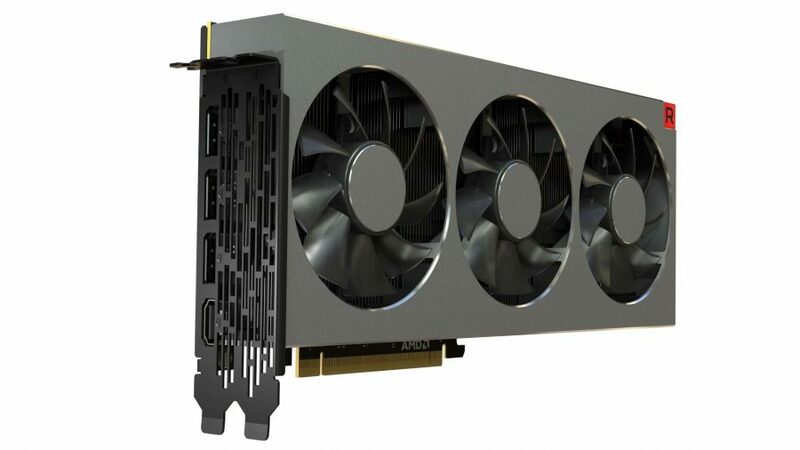 But AMD has prior form on supply issues with its Vega cards, and there is inevitably some concern the situation might be repeated when the Radeon VII cards are due to hit the shelves. If supply is tight that $699 sticker price could rise pretty drastically as retailers sense a way to make a quick buck from early Radeon adopters. That happened with the RX Vega cards, where supply was limited and pricing inevitably skyrocketed. Though AMD didn’t help itself there by having a short-term launch price, which it only communicated as such after the prices started to rise. The original price tag for the Vega cards was then revealed as a special launch offer, operated via rebates for retailers, and meant the ‘real’ price was almost immediately £100 higher. Is the $699 of the Radeon VII a genuine MSRP or are we going to find ourselves experiencing another rebate-powered bait and switch? I’m hopeful AMD will have learned its lessons, and the fact that it has issued the earlier statement does make me more confident, but we won’t know for sure until a little after launch. This was the first time a specific Radeon VII card was mentioned, and if it does genuinely cost some $750 to build that would result in AMD looking to ship the 7nm card as a loss-leader. And that would play into the limited supply run rumours and the possibility of a sizable price hike post-launch. With 16GB of HBM2, and using the 7nm production process, it is going to be an expensive GPU to produce, and I’ve got to believe that if AMD could have significantly undercut the RTX 2080 on pricing then it absolutely would have done. That’s how it has made such impressive strides against Intel on the CPU side, and if AMD could afford to create a $500 Radeon VII with this level of performance it would have really caused Nvidia some genuine problems. Whatever the reality of it all, the likelihood of February 8 rolling around and there being any $699 Radeon VII cards left to buy is pretty darned minimal. And that means, even if AMD’s bold claims of performance parity – even superiority – over the RTX 2080 ring true after independent testing, it could all be for naught if the cards end up either being far more expensive, or simply completely unavailable. But it’s not just gamers’ hopes being crushed by a runaway hype train that could create problems for AMD; financial analysts could too. 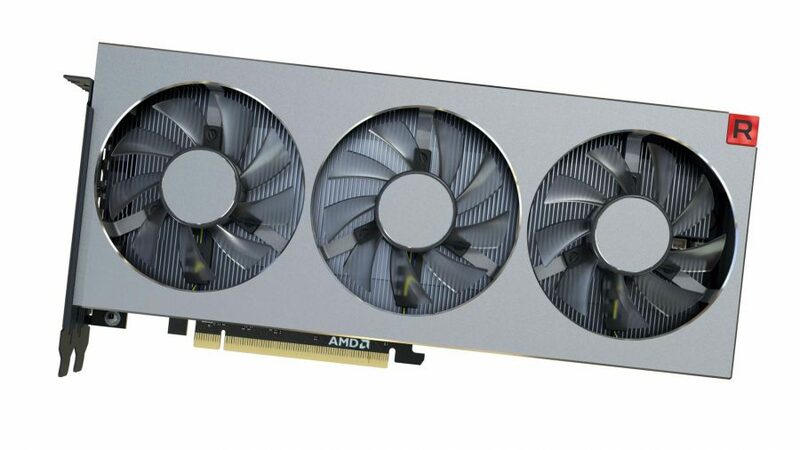 With articles such as this on Seeking Alpha, suggesting “reasons investors should expect revenue growth and market share gains from this new GPU,” investors are being hyped up for the new Radeon VII graphics hardware. And that could backfire if the card is not the success it’s being made out to inevitably be. 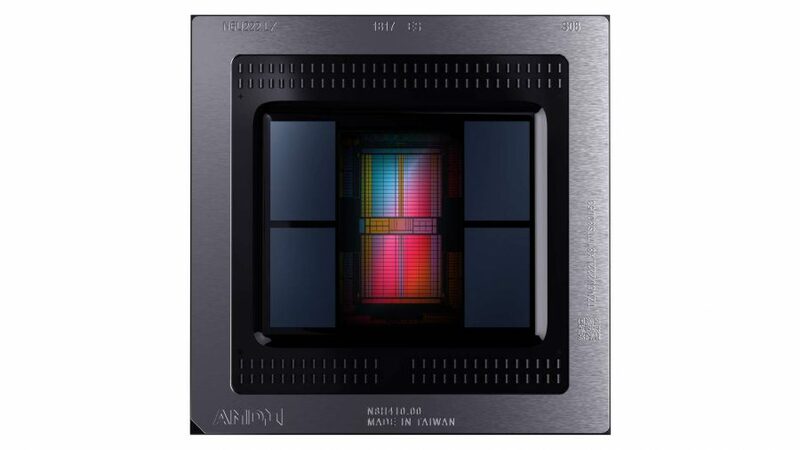 Investors can be fickle – just ask Nvidia – and there could be a financial backlash if the new 7nm GPU doesn’t boost AMD’s bottom line in future earnings assessments. If necessary some managed expectations from AMD, such as a few more gaming benchmarks, or further updates about the pricing and availability of the Radeon VII, might go some way to alleviating any of the potential damage wrought by a runaway hype train. Hell, even some pictures of warehouses full of reference Radeon VII cards would really help. But if left completely unchecked a loose GPU caboose could create some serious post-launch problems. Which would be a massive shame as the 7nm Radeon VII has the potential to be an excellent high-performance GPU, and some serious competition for Nvidia at the high-end of the graphics game. 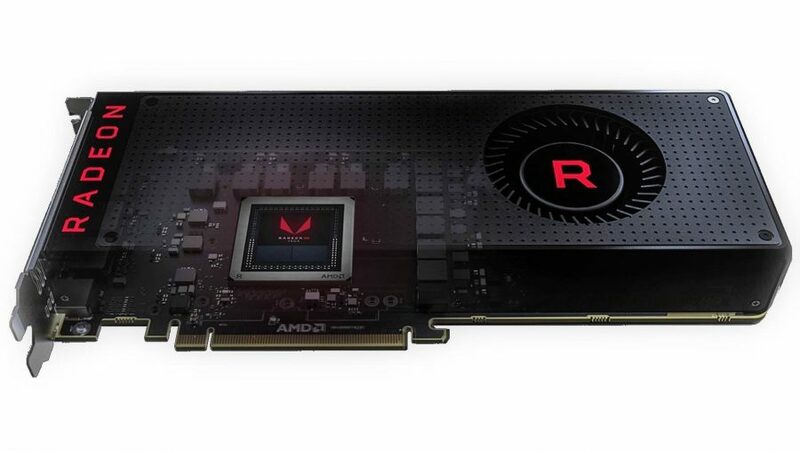 Competition is vital, so we need AMD to come back in at this level and keep Nvidia honest, and the Radeon VII could be a really important GPU in terms of the red team’s 2019 graphics plans.